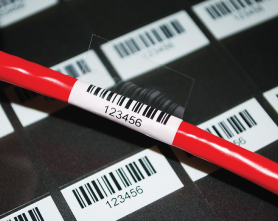 Improve work efficiency and safety by keeping track of all your cables and wires with self-laminating cable and wire marker labels from Electronic Imaging Materials, Inc. We offer easy-to-use, Wrap-N-Vu® labels, designed to identify all sizes of wires and cables quickly, clearly and economically. They come with a white print area at one end and plenty of clear material to wrap completely around your cables and back over your printed information to protect it from scratches, water, chemicals and solvents. We also offer CUSTOM PRINTED Sheet and Roll Form Cable Labels – partially or fully printed for you in full color or black and white so you can color code your wires or add graphics. The Label Experts can help you select the right stock label, or we can work with you to create a totally custom solution. We specialize in blank wire and cable marking labels for printing on demand with sheet-form laser and inkjet printers. Our laser cable labels are available in 16 different sizes, in 17 different formats to cover all of your wire and cable marking needs—including the popular CAT 5 and CAT 6 network cables. Made of clear polyester rated for service from 0°F to 275°F, our laser cable labels are suitable for indoor and outdoor use. They can be easily formatted with any PC connected to a laser printer and we supply simple Microsoft® Word templates that will be e-mailed to you upon purchase. Our roll-form Thermal Transfer Cable Labels give you the flexibility to print one or hundreds of labels at one time. They come in 3 popular sizes to fit the widest range of cables, including the popular CAT 5 and CAT 6 network cables. Made of clear polyester rated for service from -60°F to 250°F, our thermal transfer cable labels are also suitable for indoor and outdoor use. They can be easily formatted with any PC connected to a thermal printer and we supply BarTender® Label templates upon request. If you don’t already have a thermal transfer printer, ask us about our developing a Custom Printing System for Cable Labels. The Label Experts can help choose a TSC or Zebra label printer, BarTender® software, labels, and a printing ribbon.